Data loss problem always happen during the iOS 9 update as well as other iOS operating system. So when you are encountered with such text messages loss problem, firstly, please calm down and turn on Airplane mode to escape more data from being erased or overwritten. 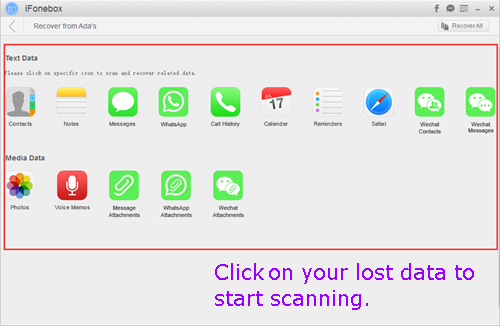 Then, follow our method to help you get back lost text messages from iPhone during the process of iOS 9 update. When you update to iOS 9 and found some data like text messages are lost, it maybe because that iOS 9 messages data base is different from the older iOS versions, but the messages are still in your iPhone. At this point, you can use iFonebox to scan and get back those lost text messages from your iPhone 6. As is known that iFonebox is a professional iOS data recovery software which can not only get back deleted or lost data like contacts, notes, iMessages, WeChat data and more from iPhone/iPad/iPod Touch, but extract and restore lost data from iTunes or iCloud backup selectively if you have backup files for your lost data. There are three working modes for you to choose: Recover from iOS Device, Recover from iTunes Backup and Recover from iCloud Backup mode. Here, I will take Recover from iOS Device mode as example. How to get back lost text messages from iPhone 6 running iOS 9? Launch iFonebox. Choose Recover from iOS Device. Please connect your iPhone to the computer so as to scan messages from it. Scan text messages from iPhone. Click Messages item to start scanning. Preview and select lost text messages to recover. After you have picked out lost text messages, just click Recover to PC button to end the whole process. Notes: if you have an iTunes or iCloud backup for your lost text messages, you can also choose Recover from iTunes/iCloud Backup mode to get back those lost text messages. The above is how to get back lost text messages from iPhone 6 running iOS 9 with iFonebox, pretty convenient and powerful. Any problems or suggestions for us? How To Recover Deleted WeChat Messages From iPhone 6? How Can I Recover My Deleted Text Messages Without Using iCloud? This entry was posted in iOS 9, iPhone 6 and tagged get back ios 9 lost text messages, recover iphone 6 lost text messages by IosdroneD. Bookmark the permalink.